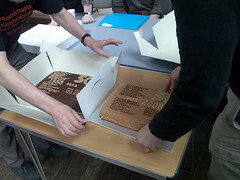 I’m happy to be able to confirm that the cakes were as tasty as they looked, and much enjoyed by all present. I like Steve’s colour-coordinated shirt paticularly. Did he change into a beige one to cut the 2008 cake? 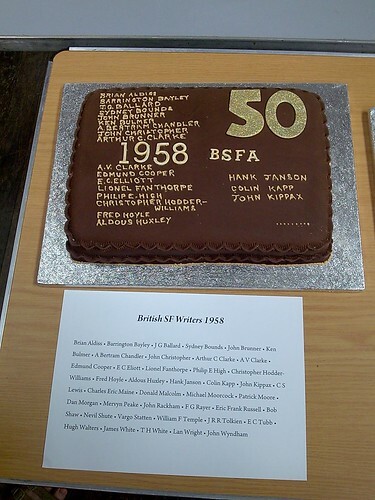 Nice to see Brian Aldiss on both cakes. Geoff’s talk was called “How I became Sheri S. Tepper without even trying”, and he read pieces of his latest story (a novelette due for publication in F&SF in the next few issues) interspersed with thoughts about the science behind it, and how he solved some of the problems which arose. The story involves a future planet (was it Earth? I don’t recall) populated with human-animal hybrids, where initially it was humans carrying the genetic information of animal species as dormant artificial chromosomes, then when a plague started to kill off all the pure humans the chromosomes were expressed and disease-resistant human-animal hybrids were formed. He said this was a way he found of writing a far-future Mundane SF story, from my perspective the idea of making viable animal-human hybrids this way is as much a magic wand as the idea of wormholes of FTL travel, so I don’t find that argument very convincing, but it’s clear he wasn’t focusing on it as a mundane piece that much anyway, and it sounded like a really interesting story which I would like to read more of. The cake was very nice and not a lie. And Michael Moorcock is also on both lists. 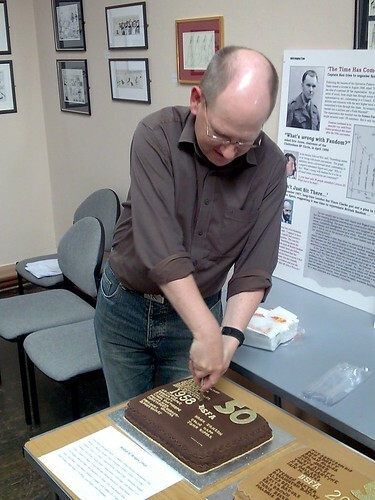 “And Michael Moorcock is also on both lists…” Both lists, but not both cakes. 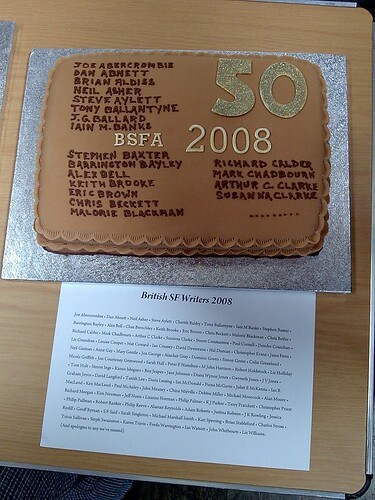 Saying ‘you can only fit so many names on a cake, so there were print-outs’ is all very well and good, but you’re not going to persuade me that a print-out is as prestigious a platform for your name as cake icing. There’s simply no contest. Which is why I shall be submitting a deed-poll to change my name to Adam Aaaberts. All hail El Presidente Baxter! The great Apu malku of our hallowed association. The Ganga Zumba of our little genre. Hail! Isn’t Barrington Bayley on both lists too? The forgotten man almost of British SF. I wouldn’t say he is forgotten but when did he last publish something?